Kansas has made great strides in recent years in improving the bicycle friendliness of the state, including safer roads, more equitable laws, and changes in attitudes towards bicycle transportation. Kansans are beginning to realize, and embrace, the potential for bicycles to improve their health, wealth, and quality of life. The Bicycle Friendly State program "ranks states annually based on their level of bike-friendliness". 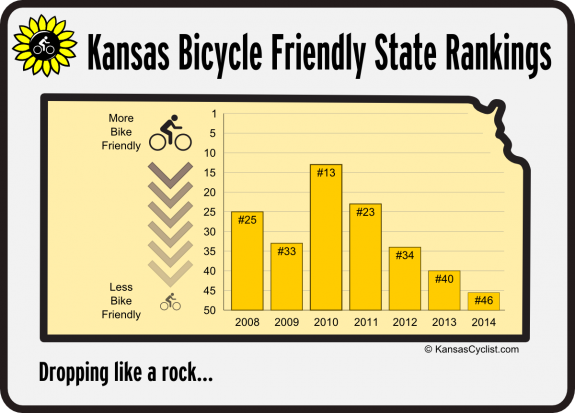 Kansas is currently ranked as #48 in the Bicycle Friendly State rankings. Here is the current report card. "A Bicycle Friendly Community welcomes cyclists by providing safe accommodation for cycling and encouraging people to bike for transportation and recreation." Lawrence – Bronze, awarded in 2004. Manhattan – Bronze, awarded in 2012. Shawnee – Bronze, awarded in 2003. In addition, Leawood made the "Honorable Mention" list in Fall 2011, Topeka made the "Honorable Mention" list in Spring 2013, and Wichita made the "Honorable Mention" list in Spring 2015. The Bicycle Friendly Business program "recognizes employers' efforts to encourage a more bicycle friendly atmosphere for employees and customers". The Bicycle Friendly University program "recognizes institutions of higher education for promoting and providing a more bicycle-friendly campus for students, staff and visitors". Kansas currently has one Bicycle Friendly University: Kansas State University, awarded the Bronze Level in 2015. The Bicycle Friendly America program provides incentives, hands-on assistance, and award recognition for communities, universities and businesses that actively support bicycling, and ranks states annually based on their level of bike-friendliness. The Bicycle Friendly America program has been a boon in raising awareness and encouraging people to make their communities better places to ride a bike. If your community, business, or university is proud of its bicycle friendliness, please encourage your leaders to apply to the League and share the good news! Conversely, if your community, business, or university is not as friendly as cyclist may wish, please encourage your leaders to contact the League and learn how to make improvements. Becoming bicycle friendly is a great way to attract cyclists to a community, business, or university, and pays great dividends in health, cost savings, and quality of life. Learn more from the Bicycle Friendly America Brochure and Bicycle Friendly America Guide.